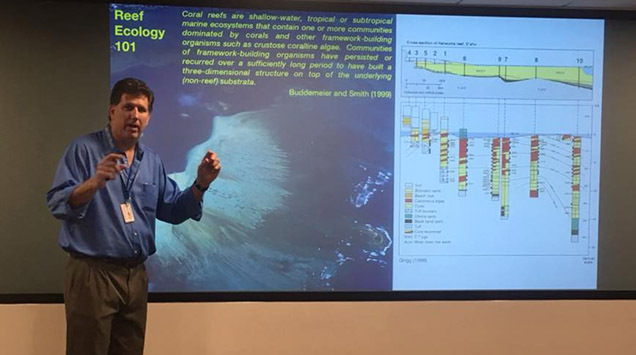 BIOS reef ecologist Eric Hochberg, principal investigator of the COral Reef Airborne Laboratory (CORAL) mission, provided a lunchtime seminar to scientists and staff at NASA headquarters in Washington, D.C. on August 15 to outline the mission’s goals, science, and status. The investigation, funded by the NASA Earth Venture Suborbital-2 Project, aims to provide critical data and new models needed to analyze the status of coral reefs around the world and predict their future. Hochberg visited Washington in August for the HysPIRI and Surface Biology and Geology Science Applications Workshop, during which he gave two presentations about remote sensing technologies and their science applications. The first, similar to the seminar at NASA, gave a status update and discussed lessons learned from the first three years of the CORAL mission. The second talk focused on using CORAL as a pathfinder for subsequent NASA satellite missions—that is, how to scale up the CORAL science and logistics from airborne to satellite platforms. Following these meetings, Hochberg and other CORAL scientists from both BIOS and partnering institutions met at the California Institute of Technology in Pasadena for the annual CORAL Science Team Meeting. Attendees defined and assigned tasks for the final year of the mission. With fieldwork completed in the first two years, CORAL scientists are now focused on refining a set of algorithms that will allow them to remove the influences of air and water from airborne data in order to obtain a more accurate picture of the reef.